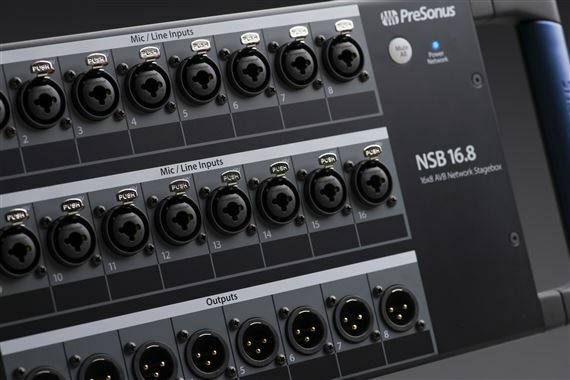 Order your PreSonus NSB 16.8 16x8 AVB Networked Stage Box from AMS and enjoy 0% Interest Payment Plans, Free Shipping, Free Extended Warranty & 45 Day Money Back Guarantee. Designed to work seamlessly with PreSonus StudioLive Series III mixers, the PreSonus NSB 16.8 stage box offers 16 locking combo mic/line inputs with remote-controlled XMAX preamps that include gain compensation for shared input scenarios. You also get 16 direct inputs via AVB. All inputs can be controlled from a StudioLive Series III console and from free PreSonus UC Surface software. All eight outputs employ locking XLR jacks. A built in 2-port AVB switch lets you daisy-chain multiple units. A rugged steel chassis with sturdy handles and a stage box form factor allow the NSB 16.8 to sit well on the stage and survive the rigors of the road. The unit can be rack mounted with an optional rack-ear kit.